Welcome to the Digital Design Team's first ever blog hop! We've got a special set to showcase for you in twelve exciting ways, you are not going to want to miss out on the fun! We're using the set Year Round Calendar, which is great to use for so many different projects. Each design team member has taken a month and will show you what they can do. Every great hop comes with a great prize, and this one is no different. Two different hoppers will be chosen to receive this wonderful set! To be eligible to win the prize, you must comment on every blog. Patti is starting us off with the month of January. Here is your list of design team blogs to visit should you get lost along the way. Once you have visited all of the blogs and left comments along the way, please head back here and leave a comment on this blog telling us what you would like to do with this set. The winners will be announced here on the CDS blog on Wednesday, November 9th. Hi Friends, welcome to a fun filled Tuesday Tutorial. Today, Lori wanted us to focus on some detailed descriptions on how you can use the new Designer Dies that were just released this month. Here is a card that I created using the new Designer Label Dies as well as our FREEBIE digital image that we are offering this month for or to play in October's Clearly Inspired Challenge. Just click on the freebie text (above), add to shopping cart and print. The Designer Labels are the very first Clear Dollar Stamps dies and they won't be the last either, but what a fabulous way to start CDS very own line of dies. Click HERE to see the computer generated photo of some of the die options. When you order your very own set or if you already have you set, we want you to be successful when you use them. Seriously, the options are limitless and ease is bar none. The premise of these dies is to coordinate with matching stamps. There are 3 coordinating clear stamp sets that are made to work with these dies - Designer Label Additions, Designer Label Christmas Tags, and Curved Sentiments. Here is a photo of what you'll receive for the Designer Labels: a set of 3 metal dies as well as 3 plastic guides too. You will use these in basically 2 main ways and you will consistently use them both ways. Stamp your images and then cut with your dies. I'm going to show you how you can get perfect placement by using the clear positioners with your new dies. I've got all 3 main shapes in the picture below along with the matching stamps. As you can see, I've already stamped my images. Next, grab your clear positioners. Make NOTE that each one has text that says THIS SIDE UP. Make sure that when you are placing your clear pieces that you can read it correctly. Notice those small little "handles" with the holes in them? Those are the key to perfect die cutting. After you have stamped your image, line up the clear piece over your stamped image, and then use a pen/pencil and mark right in the center of those "handles". Next, you will remove the clear plastic pieces, grab your metal dies and match your marks from your "handles". Don't forget to tape your your dies down onto the cardstock to prevent shifting when cutting. In the cuttlebug, you will use the same sandwich that you use for your nesties... A, B, Dies (face down), and then C (listed from the bottom up). This is what you will end up with... perfectly placed and cut dies and images. Here are some more pictures to help you visualize what you can do with these dies and what the shapes look like. Here is the largest die shape. As you can see many of the pieces are interchangeable which again provides so many options and looks. And here are some ways you can layer these dies and stamps. Imagine the possibilies when you add in your Clearly Coordinating Cardstock to the above options too. Plus, these dies work with so many Clear Dollar Stamps that you already have. Now, if you didn't realize, a new Clearly Inspired Cahllenge is going on right now. You've got all month to play and because we really want to focus on CDs stamps and how you create with them, but we also realize that there are many just starting their CDS collection we wanted to offer a FREE digital image for you to play with too! Then matched the marks with the die itself, taped it down and cut. I also decided I still wanted a mat around my image so all I did was trace around the label die and then just hand cut. It was seriously not a difficult cut at all. Here it is on my card again. I then used one of the other dies to stamp my sentiment on. Many of the sentiments from All Around Sentiments fit perfectly on this rectangular die. So, I hope this tutorial helped you to visualize what these new dies are all about and what they can add to your card making arsenal. The shapes are beautiful and the matching stamps are so fun to use with them and the uses are limitless. CLICK HERE to see more samples that were shared during sneak peeks. Don't worry though... your dies will come beautifully packaged with a fabulous sheet that you can refer back to when creating your beautiful layers! Plus, the dies are on being introduced for a phenomenal price. Don't forget to join us for this month's challenge... no excuses friends... grab that free digi and get to creating. 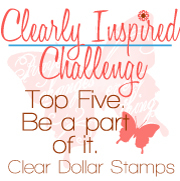 Thank you all for joining us and spending your time here at Clearly iStamp. Hi Friends, its Katie here with another Tuesday Tutorial. Today, I'm going to focus on a new product that Lori is carrying at the store that is a great accessory to your stamping arsenal and won't break the budget. Sponge daubers won't necessarily do anything revolutionary but they are a great alternative to using regular sponges or other "sponging" tools. They are very convenient and easy to use. The sponge will stain, but you can rinse/wash them and continue to use them with other inks, although once you use them, you'll probably want to dedicate at least a few for your most used colors. With this in mind, I've created a couple of cards for you today that showcase a couple of ways to use your sponge daubers and some hints to help you along. There are a couple of reasons that I like to sponge around an image. The main one is to "soften" the look surrounding the space around any stamped image. Another reason is to give dimension to your cardstock edges, and finally, sponging is a great way to create an "edge" or "border" when you are working with your Spellbinders Nestabilities. I'm going to start with the way I sponge the most. In the picture below you can see that I have alraedy stamped this bee image. I decided to go with a bit of non-traditional "bee" color and the new Clearly Coordinate Collection inks were perfect. I used Hot Cocoa and Wild Ginger to stamp my bee and the set called Home Sweet Hive. As you saw, I used a circle nestability to cut my image. Once its cut, the key is to keep the die and image intact. The key to the soft sponged look is to NOT make DIRECT contact with your sponge dauber and your paper. I personally like the feel of a slick surface while I'm doing this and for my purposes, I use a sheet of clear acetate as my work surface. I also like to add ink to my work surface versus going straight from my ink pad. I decided to use Tropical Mist as my sponging color. SOFT... LIGHT...GENTLE...AIRY... these are the MOST IMPORTANT WORDS TO REMEMBER! Less is definitely more in this circumstance. You can always add more color as you go. I also work in a circular motion when adding the ink to the paper. I personally use a counter clockwise motion. I also actually do this circular motion before I even make it onto the cut image. You are basically traveling onto your image. Remove die and you get a prefectly sponged image plus a great border as well. REMEMBER to wipe off your die afterwards with a tissue to get rid of any residual ink. Below is close up of direct contact of the inked sponge dauber and cardstock. You can see that its not as soft and you can actually see the print of the sponge. Another way to use the sponge dauber is to apply ink directly to the edges of your cardstock. For this example I decided to ink up my card base. I generally always use the Cottonball White as my card bases and if I don't want the white to show, I'll often just ink the edges. Again, this gives a softer look than applying the ink pad directly to your cardstock edges. Another great use of the sponge dauber is for a technique called emboss resist. Again, allows for a bit more control than a squished up sponge. For this card, I grabbed a new release stamp called Peace Out and stamped it with Versamark, covered it with Clear Embossing Powder. I used Cottonball White as my card base and once everything had been embossed it is just a matter of applying your ink. I used the same sheet of acetate to lay my ink down. The nice thing about this method of application and technique is that there is a lot less finesse needed. You will be adding additional colors and they will just blend together and your goal isn't for the soft sponge look this time around. Here is my finished card. You will definitely want dedicated sponge daubers per color for this technique. But remember, you can just wash these and then re-use at a later time. That's it for me today... if you noticed I just gave you all an inadvertent sneak peek of something... did you guess what it is? Thanks for coming by and visiting us here at Clearly iStamp! Have a wonderful Tuesday. Hi friends, its Katie here to share today's Tuesday Tutorial with you. I hope you all had a safe and enjoyable holiday. Today, I'm focusing on a product that Lori introduced a few months ago which is pretty darn cool. These clear ultrafine Microbeads are a great and different way to embellish your cards and images. I'm also going to share one of my favorite new release stamps for the month of July. The Striped Background is a simple 2 lined image that allows you to create your very own backgrounds. Today, I paired the microbeads and this technique to create this card. Let's start with the striped background. Take your stamp and because I'm using Copics, I am using the Memento Tuxedo Black ink. Stamp in one direction... remember you don't have to be all perfect with this, in fact its better to have different spacing. The lines of this stamp image are not perfectly straight which just makes this whole concept fun and easy. Turn your piece and stamp the lines across again. I love the fact that I can use the CHISEL end of my Copic marker. It just makes me happy :) This technique is all about easy. You don't have to fill in all the white space and you just quickly run your marker between the lines. No need to be perfect here! And here is your custom plaid background. Now its time to create our image. I used a tree from the set Scenic Trees for my focus image. I stamped in regular dye ink. I then cut both the tree image and my Scor-Tape (6x6) with the same long rectangle nestability. Peel off the bottom layer and line up with your cut image. I used my scor tool and burnished it down before peeling off the top layer. Then just peel that top layer off. Tuck under any excess tape you might have hanging over your edges. Now, just pour your micro beads over the top of the entire surface and shake off excess. And one picture to help you see the difference between these beads and a different brand. The Clear Dollar Ultra Fine beads are on the bottom and the other brand is on top. Don't forget that coordinating Spruce Needle Ribbon on my card too :) Thank you for coming to visit Clearly iStamp. I hope you stop by the store and grab some of these great new stamps and fun embellishments.